The reader finished reading the novel and was puzzled. The reader was I. She tipped her head to one side as though she had just been swimming and there might be water in her ears, but what was actually inside her head was a complicated reaction. She was thinking deeply about this novel, and she had a lot to mull over. She was accustomed to reading unusual fiction, I think, such as weird fiction and irreal fiction, but Miéville’s short novel defied classification and, especially in the beginning, the sometimes mannered prose was hard to like; she continued to hold her head to one side and thought about the books by China Miéville that she had read before. She liked Embassytown and The City and the City but had always hesitated to call this writer irreal, especially since he so often insists that his fiction is New Weird. OK, I’ll stop. But rest assured that I am not parodying This Census-Taker. The novel has affected me, making me feel as though Miéville’s purposeful obfuscation, his prose that switches from first to third person and back again from the very first paragraph, his tendency to hint rather than explain, his use of steganography (meaning that a message is concealed within other text as in the title of this blog post) – all these devices lead the reader to stumble along sometimes, wondering where I am being led, but in the end I don’t want to give up. In other words, This Census-Taker is a compelling read in spite of its complex and purposeful opacity. The reader is asked to pay careful attention, to work for meaning, yet (as Matous Hrdina noted in the above quote) meaning is often withheld. Even when the reader solves the simple steganographic puzzles, the meanings of those solutions are obscure. I don’t know whether or not this is a secret Bas-Lag story, as Christina Schulz at Strange Horizons claims (http://www.strangehorizons.com/reviews/2016/03/this_censustake.shtml). 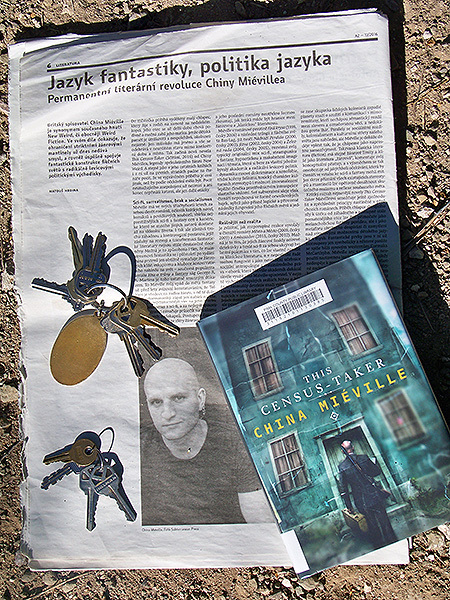 I’m not sure if it’s true, as Francis Spufford at The Guardian has it, that “Repeatedly, as a writer of the fantastic, [Miéville] forces a redefinition of what fantasy can be.” (https://www.theguardian.com/books/2016/mar/02/the-census-taker-china-mieville-review-novella) I don’t claim to know precisely what Miéville is doing, but I do know about the effect his work has on me as a reader. It certainly undermines my expectations about genre. The story itself, which begins with a boy running down a hill, screaming, frantic to tell others that his mother has killed his father (or the other way around) at first seems more like a murder mystery than anything. But I usually read a murder mystery to find out who murdered whom and why, and there’s so much sleight-of-hand misdirection going on in this novel that solutions are hard to come by. There are fantasy elements (those keys the narrator’s father makes and what people do with them seems a lot like magic) and there are science fiction elements (the lives of those children who live on a bridge and “fish” for bats remind us of other dystopian stories), but This Census-Taker revels too much in its own obfuscations to be easily categorized. But despite its tendency toward opacity, This Census-Taker is quite certainly about an outsider and an immigrant who may also be a killer. It also remains resolutely and purposefully a story about a child who feels unsafe in his own home and community. And there are plenty of the strange and disturbing images we might expect to find in New Weird fiction. In the end, though I’m not inclined to call it irreal, I am inclined to say that you should read it for the practice it will give you in reading a narrative that compels you to turn the pages as much as any thriller does, eager to reach the explanation at the end, and more than anything else, when that explanation does not entirely satisfy, leaves you eager to see what this writer will have to say next.